We have a unique gift for you. 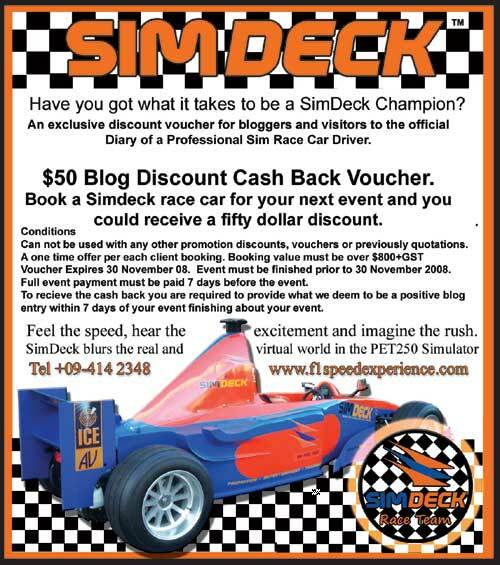 How would you like to be paid a $50 cash back discount simply by writing some positive comments about your SimDeck Racing Event. This offer is only valid in NZ and closes on 30th January. Some conditions do apply of course which are on the displayed voucher. This offer requires that you either post a print of the voucher physically poste to us or you can emailed to us with your booking and when you pay your initial event deposit. It can not be applied at any other time. Please note your event must be a minimum value as listed on your voucher. After the event you will need to write a blog entry on this web site after we have posted your Simdeck Virtual Grand Prix. Once this is completed you will recieve your Cash Back discount. Please note FULL PAYMENT is required before the event to be eligible in the first instance. The Cash Back discount can not deducted from any balance payments after the event if you payment is late. Where else can you be paid for writing on a blog? Contact Pit Lane Booking Office Today. 09-414 2348 before someone else secures your prefered date.